...And it came to pass in those days, that there went out a decree from Caesar Augustus that all the world should be taxed. And this taxing was first made when Cyrenius was governor of Syria. And all went to be taxed, every one into his own city. 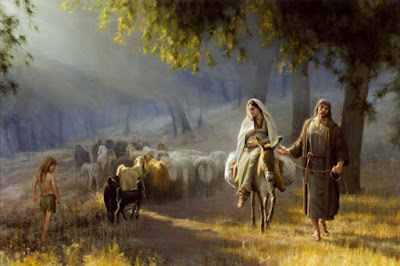 And Joseph also went up from Galilee, out of the city of Nazareth, into Judaea, unto the city of David, which is called Bethlehem; because he was of the house and lineage of David: To be taxed with Mary his espoused wife, being great with child. And so it was, that, while they were there, the days were accomplished that she should be delivered. And she brought forth her firstborn son, and wrapped him in swaddling clothes, and laid him in a manger; because there was no room for them in the inn. ...And it came to pass, as the angels were gone away from them into heaven, the shepherds said one to another, Let us now go even unto Bethlehem, and see this thing which is come to pass, which the Lord hath made known unto us. And they came with haste, and found Mary, and Joseph, and the babe lying in a manger. And when they had seen it, they made known abroad the saying which was told them concerning this child. And all they that heard it wondered at those things which were told them by the shepherds. But Mary kept all these things, and pondered them in her heart.